What have scientists learned about its cause and consequences? 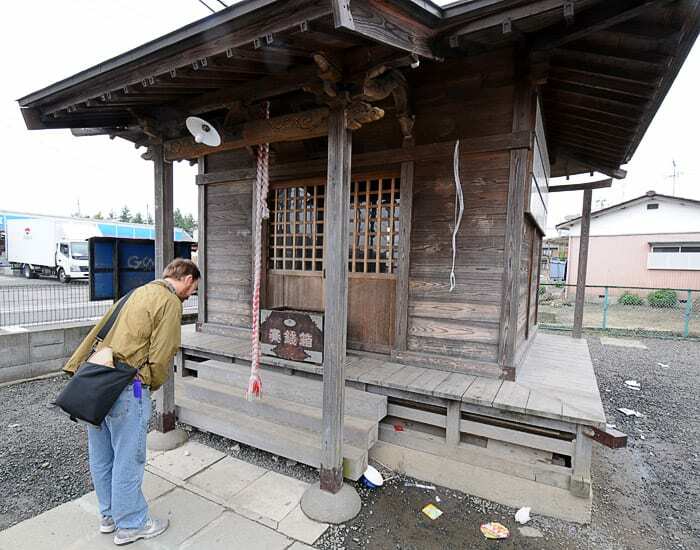 When the ground in Japan started shaking on March 11, 2011, the Japanese, who are well accustomed to earthquakes, knew this time was different. They weren’t surprised—the fault that ruptured has a long record of activity. But this time the trembling continued for six minutes. When it finished, many turned their eyes to the sea off the country’s craggy and quake-scarred coast, as they are taught, and waited for the waves to come. But the last time something remotely similar had happened was more than 1,000 years ago and, even in a country that prides itself on its shared cultural memory of the distant past, that event had been largely forgotten. Since that time, much has changed. People and development have sprung up along the coast, along with a string of nuclear reactors. Everything, it seemed, had changed in the intervening millennium—except the ocean. The majority of these events played out in the ocean, noted Jian Lin, a seismologist at Woods Hole Oceanographic Institution (WHOI). The Tohoku earthquake also triggered a cascade of scientific dominoes, as geologists, geophysicists, chemists, modelers, physical oceanographers, and marine biologists mobilized to understand the causes and consequences of the earthquake. The undersea fault that ruptured on March 11 extends north-south about 500 miles, roughly parallel to the northeast coast of Japan. It is a mega-thrust fault in the Japan Trench, where the massive Pacific Plate pushes westward, and beneath, the continental Eurasian Plate. Where the two tectonic plates grind against one another, gargantuan stress builds over time in the seafloor crust. Hundreds of large and small earthquakes dot the fault each year as stress exceeds the breaking point of rocks and releases. The immense forces of two colliding plates, said Lin, have compressed the Japanese island of Honshu like an accordion, pushing up the mountain ranges that fill much of the island’s interior and creating a spider web of smaller, land-based faults that periodically rupture. As a result, the Japanese have made living with seismic activity part of their daily life and national culture. Each year, schools and businesses across the country mark Disaster Prevention Day on Sept. 1, the anniversary of the 1923 earthquake that devastated Tokyo, by participating in drills and other activities to prepare for a large earthquake. Building codes are laden with requirements intended to prevent high-rise buildings from collapsing during violent shaking. Even the iconic bullet train is connected to a network of seismic sensors designed to automatically stop any moving train before shaking from a large offshore earthquake can reach shore. When the shaking on March 11 stopped, the city of Sendai (population 1,000,000), the largest urban area near the epicenter, was largely spared—even though the temblor turned out to be the world’s fifth largest ever recorded. In Tokyo, less than 200 miles away, frightened office workers safely evacuated or rode out the six-minute quake as buildings swayed, but did not fall. On the busy railway corridor running north of Tokyo, trains slowed and stopped with very few derailments. In fact, the earthquake produced surprisingly little damage, despite the fact that national hazard maps for the region, based on data only from the last few hundred years, directed officials to prepare for a maximum magnitude of 8.0. This all-consuming focus on Earth’s seismic activity has also spurred the Japanese to create perhaps the world’s most comprehensive seismic network, one that blankets the archipelago and the nearby ocean floor with more than 1,200 sensors to monitor position and movement. The Japanese government and scientific community have also encouraged a culture in which scientists share their data with colleagues elsewhere around the world, especially after the 1995 magnitude 6.9 Kobe earthquake that claimed more than 6,000 lives. In fact, Shin’ichi Miyazaki, a geophysicsist at Kyoto University and one of Japan’s foremost experts in using GPS data to record how earthquakes move land and seafloor, was due to travel to the United States on March 14 to meet with McGuire and others. Fortunately, he was able to leave Japan before fears of radiation choked the country’s airports. When Miyazaki and McGuire sat together and looked at the data, they discovered to their surprise that after the earthquake, portions of the Japanese island of Honshu had moved 8 meters [26 feet] to the east. Had the earthquake occurred and nothing more, the Japanese people would have mourned their dead and counted themselves relatively lucky. Disaster officials would have realized their mistake and begun preparing for the possibility of larger earthquakes in the future. Geophysicists would have puzzled over the fault’s ability to release so much energy. But the quake turned out to be just the beginning. When the mega-thrust fault broke, it released the wedged-in Eurasian Plate overriding the Pacific Plate. The plate sprang eastward and upward, propelling huge amounts of water upward, raising the sea level over the fault in an instant. The pulse of water raced away from the epicenter, spreading rapidly in all directions in the form of a complex ripple as deep as the ocean. In open water, that ripple would have been barely noticeable. When it reached the continental shelf and then the shallower coastal waters around Japan, however, the wave reared up, exposing its full size, and swept ashore, in some places for miles. When they saw the news that day, Changsheng Chen and Robert Beardsley, like most people, were amazed by the power of the wave. But they also took a professional interest in the tsunami and its path of destruction. Chen, a professor at the School of Marine Science and Technology at the University of Massachusetts-Dartmouth and an adjunct scientist at WHOI, has been studying ocean circulation since the late 1980s when he was a graduate student in the MIT/WHOI Joint Program. His advisor was Beardsley, and the two have collaborated ever since. In 2000, he and Beardsley developed the Finite Volume Community Ocean Model (FVCOM), a somewhat unorthodox model of global ocean circulation that can recreate currents and patterns in complex environments such as the coastal ocean and estuaries. To understand how FVCOM differs from standard models requires physics and mathematics beyond many readers. Suffice it to say that most models divide the ocean into a rigid horizontal grid of squares and then calculate changes in surface elevation, currents, temperature, salinity, density, and other properties driven by surface forces (such as wind) and the horizontal transfer of mass, momentum, and energy among the squares. FVCOM, however, divides the marine realm into a horizontal grid of triangles of varying shapes and sizes. The difference is more than aesthetic. The triangles permit Chen to make on-the-fly changes in the resolution of particular locations. Using the model, he can, for example, produce highly detailed simulations of ocean circulation in a focused region of the ocean (such as near the Fukushima-Daiichi nuclear plant). And at the same time, he can link what’s happening in those focused regions to broad, less-detailed circulation patterns across the entire Pacific Ocean, something typical models cannot easily do. In addition, FVCOM’s grid of triangles offers more nuanced views near shore, because they can be fitted more precisely into the irregular shape of coastlines and seafloor—like those of northeastern Japan. After the tsunami struck, many were surprised by the extent of inundation along the coastline. Among those was Chen and Beardsley’s colleague Jun Sasaki, a professor of civil engineering at Yokohama National University. Sasaki and others quickly catalogued the extent of the flooding and produced detailed measurements of the flooded coast. With this data, FVCOM could potentially recreate the wave to show just how the wave formed, approached, and ultimately inundated the coast. Chen and Beardsley already had high-resolution data for winds, tides, currents, temperature, salinity and other ocean conditions in the region where the tsunami hit. But the earthquake had fundamentally and instantly changed sections of the Japanese coastline. Not only had the coastline moved a substantial distance to the east, but some places had subsided as much as 2 meters [6.5 feet] as the underlying crust relaxed. For FVCOM to produce the most accurate results, Chen and Beardsley needed accurate maps of the “new” Japanese coast, which they got from Sasaki, but they also needed help from a source they had never turned to before: marine geologists. Jian Lin has been studying large earthquakes since the 1970s, including recent ones in Algeria, Sumatra, China, Haiti, and Chile. He, like McGuire, was astounded by how much sensors in Japan’s seismic network had moved after the earthquake. By studying the pattern of their movement, Lin and colleagues were able to approximate how the fault ruptured and how much the surrounding crust actually changed shape. This helped him to determine locations on neighboring parts of the fault, north and south of the March 11 rupture zone, where stress had shifted and increased dramatically, along with the likelihood of future earthquakes. The southern portion is notable for the fact that it has ruptured before—in 1855 a large earthquake on the segment laid waste to Edo, today known as Tokyo. Almost exactly 25 years before the Tohoku earthquake, Ken Buesseler was a young marine chemist with a newly minted Ph.D. from the MIT/WHOI Joint Program. His thesis focused on the slight but measurable fingerprint of natural and manmade radiation in the Atlantic Ocean. In April 1986, Buesseler was at the Savannah River Laboratory near Aiken, S.C., measuring samples of seawater for plutonium, a byproduct of nuclear weapons testing in the 1950s and ’60s, when the first reports broke about a disaster unfolding at a Soviet nuclear power plant known as Chernobyl. For the next two decades, Buesseler refined techniques to measure the types and amount of radioactive isotopes that Chernobyl and other events fed into the ocean. Because each radioactive isotope has a unique half-life (the time it takes for half of the atoms of a particular isotope to decay), as well as byproducts of that decay, Buesseler and others use these substances to trace currents and study how water masses mix across the depth and breadth of entire ocean basins. To study Chernobyl’s marine impact, Buesseler looked to the nearest arm of the ocean, the Black Sea. With only one narrow connection to the Mediterranean through the Bosporus Strait, it is barely a part of the global ocean system. Its isolation and the fact that its surface and deep waters rarely mix allowed Buesseler to use the Black Sea as a “natural laboratory” and study such things as how the deep and surface waters interact, a key factor in why the deep Black Sea is largely devoid of oxygen (and why it often smells like rotten eggs due to sulfide buildup). Over his career, Buesseler turned his attention to other scientific problems, but when conditions at the tsunami-damaged Fukushima Dai-ichi nuclear power plant began to spin out of control, he quickly realized his expertise would be needed once again. A series of gas explosions in the buildings housing the reactors destroyed the facility beyond repair, and officials were reduced to pumping tons of water on the reactors to keep them from catastrophically overheating. Much of that water became contaminated with radionuclides and had only one place to go—into the nearby ocean. “I saw them trying to drop water on the reactors to cool them, and I saw their position on the coast and I thought, ‘This is déjà-vu all over again,’ ” he said. Buesseler immediately set about trying to get any information he could about how much and what sorts of radioactive isotopes were being pumped into the ocean. 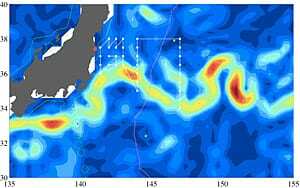 TEPCO, the Tokyo Electric Power Company, which operated the Fukushima Dai-ichi Nuclear Power Plant, was releasing some data, including the flow of water from discharge canals at the plant, and he had limited offshore measurements coming in from Japanese colleagues. But Buesseler knew that larger questions about how the radiation was mixing into the ocean or getting into the marine food chain could be answered only with a systematic look at how specific radionuclides were accumulating and moving in the ocean—from as close as he could get to the reactors and before they dispersed far offshore. Buesseler began to search for sources of funding, colleagues, and ships of opportunity to mount a major research cruise to make these critical measurements. 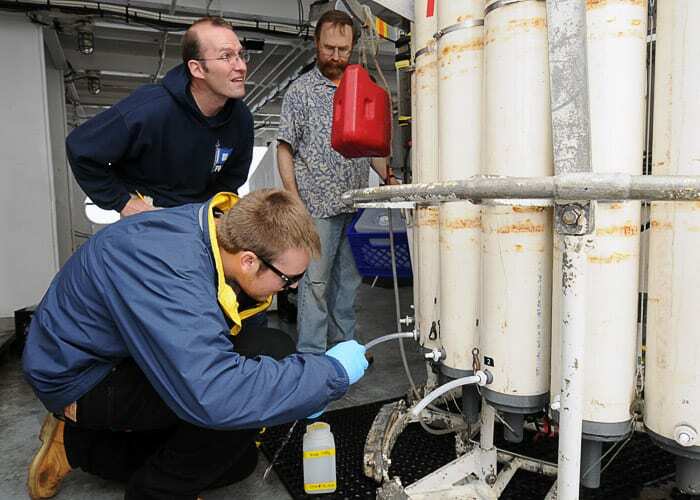 The National Science Foundation awarded him a RAPID grant on April 4 to have samples collected by colleagues around the Atlantic and Pacific and mailed to his WHOI lab so he could establish a baseline for releases from Fukushima. On May 3, the Gordon and Betty Moore Foundation provided $3.7 million to allow Buesseler to charter the research vessel Ka’imikai-O-Kanaloa (KOK) from the University of Hawaii. But there was still a Japanese bureaucracy in crisis mode to deal with and six months’ worth of cruise planning to do in five weeks’ time. “Those were the busiest five weeks of my life,” said Buesseler. On May 15, the KOK departed Honolulu for Yokohama, Japan, with the ship’s crew on board even though Buesseler did not yet have all the permits he needed. On May 22, he received permission to sample within Japan’s 200-mile exclusive economic zone. On June 6, the ship left Yokohama with a comprehensive sampling plan and a full science party of 17 people from eight institutions, but still without the crucial final permission to sample at the edge of the 18-mile exclusion zone around the reactors. That finally came from the U.S. Coast Guard on June 8, while the ship was en route to the first sampling station. Buesseler’s plans called for the team to collect water samples from the surface to as deep as 6,000 feet at 30 locations; to conduct net tows for phytoplankton, zooplankton, and nekton (free-swimming organisms) in various combinations at every station; and to sample the air and surface water continuously for radioactivity. 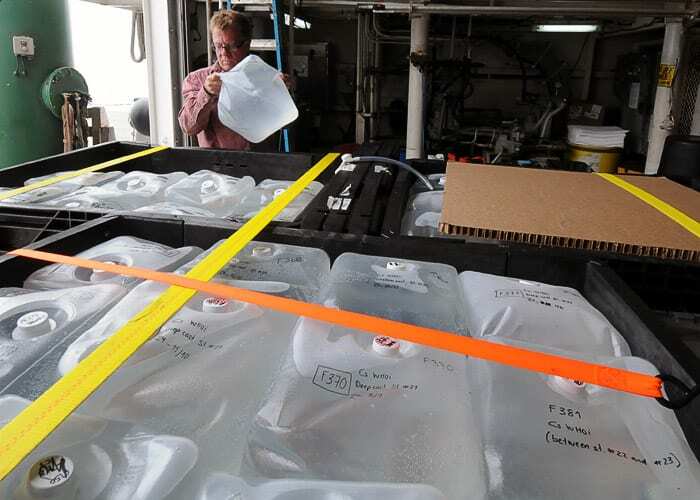 The group also collected and packaged water samples for other lab groups in other countries that would eventually be able to test the water for more than 20 different radioactive isotopes. 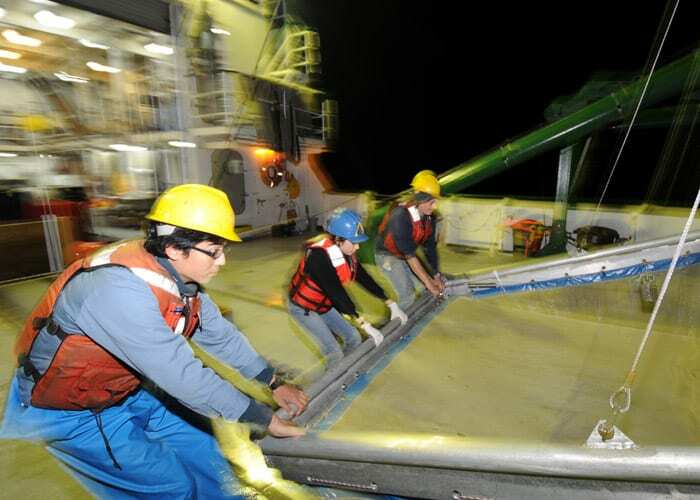 For two weeks, the KOK sailed a saw-tooth course beginning 400 miles offshore, crossing the powerful Kuroshio Current that flows from the coast of Japan into the Pacific. The final leg of the cruise began within sight of the reactor complex at Fukushima on a clear, sunny day. Also aboard the KOK was WHOI physical oceanographer Steven Jayne, who has long studied the Gulf Stream-like Kuroshio Current. He released two dozen surface drifters into the ocean during the cruise. These instruments deploy a parachute-like drogue just below the surface and transmit their locations back to shore while they move with ocean currents. Jayne used the data to map the strength and direction of branches and eddies in the current for months afterward. 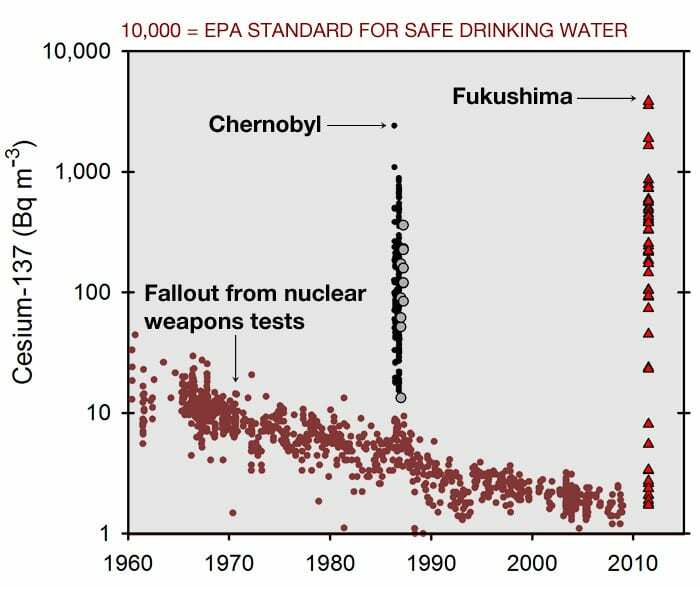 Initial results have shown that radionuclides from the reactors mixed quickly into the ocean and were diluted to levels of naturally occurring radiation within a few tens of miles of the coast. 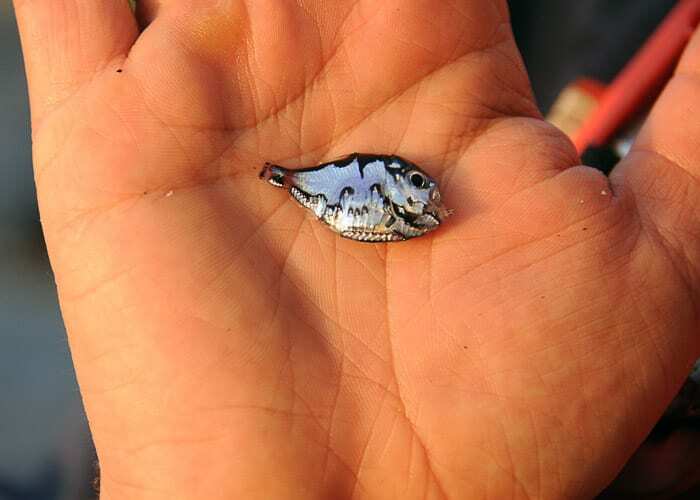 In addition, the Kuroshio appeared to act as both a highway and a barrier, carrying much of the radiation quickly away from shore while also largely preventing it from spreading south. 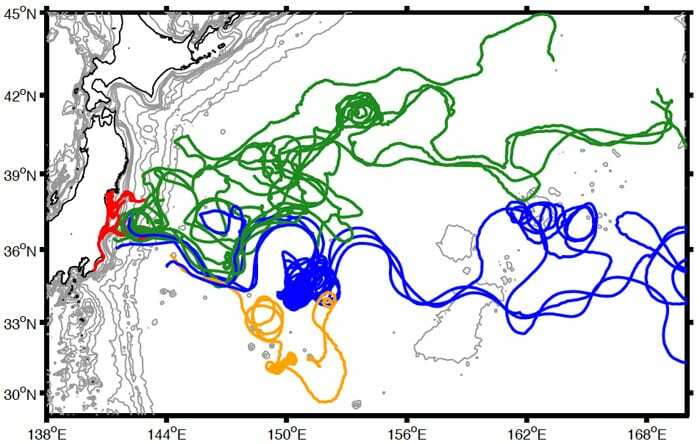 At the same time, Jayne’s drifters revealed the existence of an eddy—a swirling mass of water that periodically forms on the edges of strong currents—near the coast south of Fukushima. The eddy trapped radiation in it and resulted in the highest levels of radioactivity detected on the cruise. For years to come, similar measurements for radionuclides released from Fukushima will help oceanographers like Jayne trace currents and mixing throughout the Pacific Ocean. The scientists found that, even when sampling within sight of the nuclear power plants, levels of cesium-137 and cesium-134, two primary products of nuclear fission, were higher than normal, but still below what is considered of concern for exposure to humans. Levels were also well below thresholds of concern to the small fish and plankton, even if those were consumed by humans. Several other groups have since confirmed the findings, but these measurements have also shown disturbing new trends. For one, levels of radioactivity in fish are not decreasing, and there appear to be hot spots of radioactivity on the seafloor that are not well mapped. 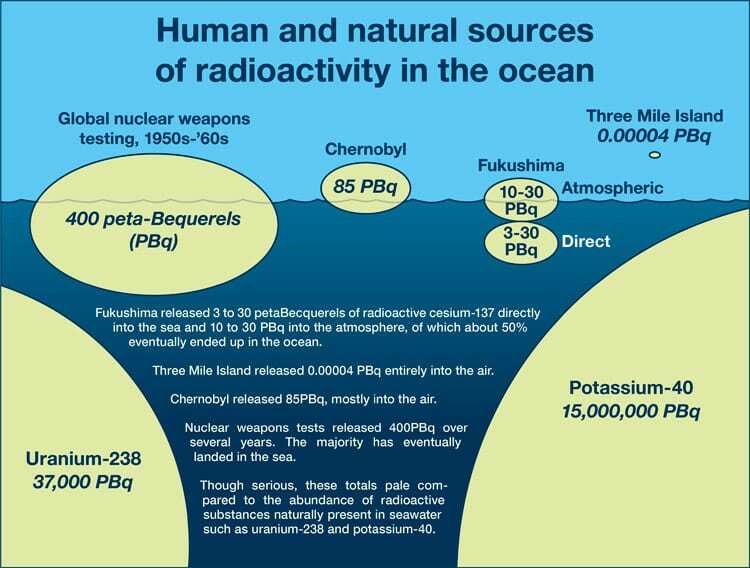 There is also still little agreement on exactly how much radioactivity was released, where it is now, where it might end up in the future, and most importantly what the real risks are to human and marine life. With all their knowledge of the ocean and what caused the cascade of events that resulted in 20,000 dead or missing and damage that will not soon be repaired for forgotten, another fundamental question remains: Were events beginning on March 11 avoidable? Certainly not entirely. Nothing could have prevented the earthquake or the ensuing tsunami. But with greater knowledge of how the offshore mega-thrust fault works—and the earthquakes and tsunamis it has been capable of generating in the past—perhaps preparations along the coast would have been more extensive. Perhaps the nuclear power plant at Fukushima might have been reconfigured to lessen or prevent the damage that resulted. Such knowledge could also inform preparations on the other side of the Pacific near another mega-thrust fault immediately off the coasts of Oregon, Washington, and British Columbia. The situation there is eerily similar to what happened in Japan in several ways. For one, earthquake and tsunami preparedness in many areas along the coast are based on a limited view of the fault’s history. As a result, many people believe the potential risk is vastly underestimated. The Cascadia Trench off the Pacific Northwest, however, lacks the instrumental network the Japanese have installed in the Japan Trench. In February, McGuire and several colleagues received funding from the W. M. Keck Foundation to install extremely sensitive tiltmeters, similar to those placed off the northeast coast of Japan, that measure extremely small deformations in the seafloor near the Cascadia Trench. These will help give a better idea of just how much strain is building along a portion of the fault and help inform assessments of which parts of the fault are most likely to rupture.